Chichen Itza or "Chichén Itzá" which means “at the mouth of the well of Itza” is the largest of the archaeological cities of the pre-Columbian Maya civilization in the Yucatan Peninsula of Mexico. It is one of Mexico's most visited tourist destinations. This ancient Maya city occupies an area of 4 square miles (10 square km) in south-central Yucatán state, Mexico. It is located in east-northeast of Uxmal and east-southeast of the city of Mérida. Chichen Itza is the northernmost of the major archaeological sites in Yucatán and is richest in monuments. Chichen Itza was founded around the 6th century, most likely by Maya peoples of the Yucatán Peninsula from the Pre-Classic Period. The major early structures are in an architectural style known as Puuc, which shows a number of differences from the styles of the southern lowlands. In the 10th century, after the collapse of the Maya cities of the southern lowlands, Chichen Itza was invaded by foreigners, the Toltec of central Mexico. Following the conquest of Yucatán, a new architectural style blending the Mayan and Toltec traditions developed. The ancient structures of Chichen Itza were overgrown with jungle and slowly decayed until major archaeological excavations began in the 1920s. Ever since, more of the ancient structures have been cleared and restored attracting increasing number of tourists each year. The ancient monuments at Chichen Itza site are grouped in a series of architectural styles, and each series was at one time separated from the other by a series of low walls. The three best known of these complexes are the Great North Platform, which includes the monuments of El Castillo, Temple of Warriors and the Great Ball Court; The Ossario Group, which includes the pyramid of the same name as well as the Temple of Xtoloc; and the Central Group, which includes the Caracol, Las Monjas, and Akab Dzib. The monuments, particularly in the northern group are among the most acknowledged masterpieces of Mesoamerican architecture because of the exquisiteness of their proportions, the sophistication of their construction and the magnificence of their sculpted decorations. 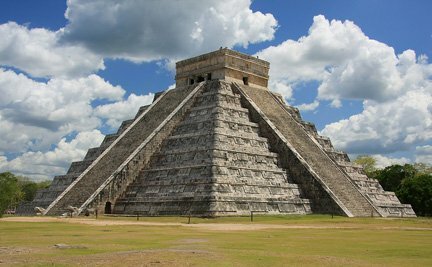 At the Chichen Itza archeological site, one of the most famous structure is the Kukulkan Pyramid or El Castillo. It is also known as the Temple of Kukulkan. It is a Mesoamerican step-pyramid that is prominent in the center of the archaeological site of Chichen Itza in Yucatán. It is one of the new Seven Wonders of the World. It was built by the pre-Columbian Maya people sometime between the 9th and 12th centuries AD. 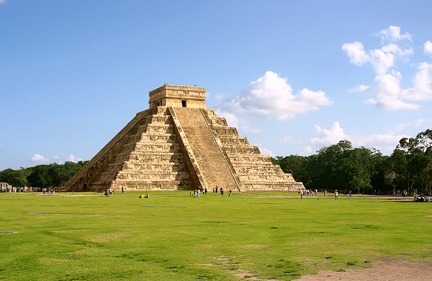 El Castillo served as a temple to the god Kukulkan, the Yucatec Maya Feathered Serpent deity that is closely related to the deity figure Quetzalcoatl known to the Aztecs and other central Mexican cultures of the Postclassic period. The height of this step pyramid is more than 29 meters. It consists of a series of square terraces where each terrace is more than 2.5 meters high with a 6 meter high temple at the top. The sides of the pyramid are approximately 55.3 meters at the base and rise at an angle of 53 degrees. The four faces of the pyramid have protruding stairways that rise at a 45-degree angle. At the base of the balustrades of the northern staircase are carved heads of a serpent. The symbolism in the architecture of El Castillo displays its connection to the important Mayan calendar. There are four stairways that lead to the central platform each having 91 steps, making a total of 364; when added to the central platform, it equals the 365 days of the solar year. On either side of each stairway, there are nine terraces making 18 on each face of the pyramid, equaling the number of months in the Maya solar calendar. There are 52 panels on the facing of these terraces representing the 52-year cycle. At the spring and fall equinoxes, the sun projects the light on the northern stairway, a pattern of light is created by the angle of the sun and the edge of the nine steps. This light in association with the massive stone carvings of snake heads at the base of the stairs, create an effect as if a massive serpent snaking down the pyramid. Looking at the western side during the winter solstice, the sun appears to climb up the edge of the staircase until it rests briefly directly above the temple before beginning its descent down the other side. At Chichen Itza archeological site, an excavation into El Castillo in the mid 1930s, another temple was found that was buried below the current one. Inside the temple chamber are a Chac Mool statue and a throne in the shape of jaguar, painted red with spots made of inlaid jade.